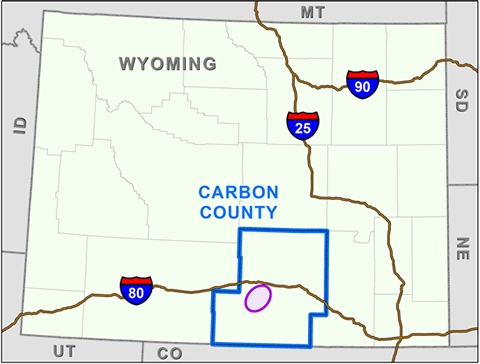 Power Company of Wyoming LLC's Chokecherry and Sierra Madre Wind Energy Project is an up to 1,000-turbine wind farm located south of Sinclair and Rawlins in Carbon County, Wyoming. The project's long-term surface disturbance will be less than 2,000 acres of a 320,000-acre ranch owned and operated by an affiliate company. With a nameplate capacity of 3,000 megawatts, the project will ensure a reliable, competitively priced supply of renewable electricity that's unmatched in the West. This output will help America reduce greenhouse-gas emissions, diversify energy sources and meet growing demand for renewable energy. At the same time, the wind project will generate hundreds of good jobs, millions of dollars in tax revenue and other economic benefits for Carbon County. owned by The Overland Trail Cattle Company LLC and federal land managed by the BLM. "Tapping the vast renewable energy resources on our nation’s public lands will create jobs while supporting a clean energy future. Wyoming has some of the best wind energy resources in the world, and there’s no doubt that this project has the potential to be a landmark example for the nation." About 50% sited on private land and 50% on federal land in Carbon County "checkerboard"
The Bureau of Land Management has completed a project-wide EIS and additional site-specific environmental analysis for the CCSM Project. Learn more about the BLM analysis. The DEQ Industrial Siting Division reviews and regulates industrial developments in Wyoming. Learn more at the ISD's CCSM Project website.